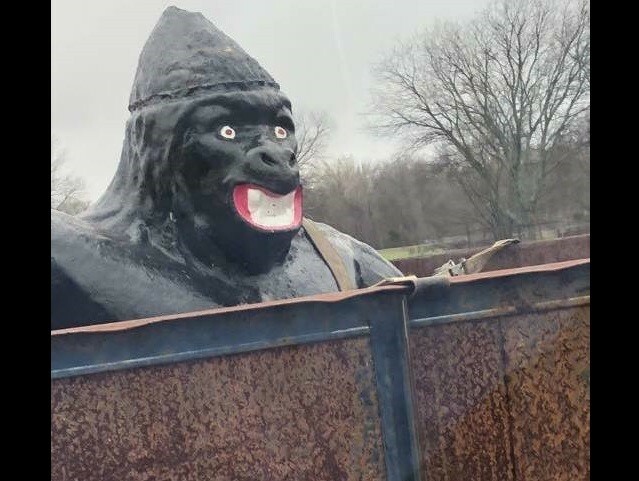 A painted gorilla statue in a cage triggered racial sensitivities and a temporary removal in a small community south of Dallas, Texas. “Dobby” the gorilla was temporarily removed from the Corsicana Community Park after the local city council took in “a few” complaints that the feature was a hurtful reminder of slavery, the Fort Worth Star-Telegram reports. Mayor Don Denbrow initially shared feelings for both sides of the issue. The mayor explained that the statue was originally caged for safety reasons to keep young climbers away. When the City began the physical removal process, a lone protester climbed into the enclosure to halt work, the Fort Worth paper added. A protest Facebook page dubbed “In Memory of Dobby” quickly began to circulate and gather likes, complete with Harambe imagery. As of publication time, the effort generated more than 1,200 followers. The Coriscana park did not go without Dobby for long, however. City council member Jeff Smith vowed to reverse the effort and proclaimed on the Facebook page Wednesday that, “We have news! Update on the gorilla … He will be placed back in the park as soon as weather permits!” Smith told local reporters that the decisions were the mayor’s alone and the matter was rushed all around. Dobby was homeless for less than 24 hours due to community pressure.